Date read: 9/29/18. Recommendation: 9/10. The amount of information in this book is incredible–biographies by Walter Isaacson are not quick reads. Throughout the book, I’d marvel at not only Leonardo, but also Isaacson’s ability to aggregate so much information and tell a compelling story. He’s brilliant in drawing out subtle themes that help tie everything together. Leonardo feels relatable and human in that his genius was self-made, built from personal experience/experiments, and dedication to his craft(s). But he also feels simultaneously distant in that the breadth of his abilities across disciplines, obsession with detail, and ability to bridge observation and imagination seem otherworldly. This book is an investment, but you’ll walk away with a reenergized curiosity and a newfound appreciation for the finer details in life. That’s what makes books like this worth it–the message resonates far stronger than what you might get out of a 200-page popular nonfiction title. Archetype of the Renaissance Man – combined art, science, engineering, technology, the humanities. -Ability to make connections across each discipline is key to innovation, imagination, creativity, and genius. -Benjamin Franklin was the Leonardo of his own era, no formal education, taught himself. -The world has produced other thinkers who were more profound and logical, and many who were more practical, but none who was so creative in so many different fields. -He had almost no schooling, his genius was based on skills of curiosity and intense observation. -Ability to blur the lines of reality and fantasy, marrying observation and imagination, was key to his creative genius/innovation. -Obsession is a component of genius. Teaches us to marvel about the world we encounter each day, appreciate details, and make each moment of our lives richer. -Born out of wedlock so wasn't required to pursue family notary business. Instead, able to pursue creative passions. -Took pride in lack of formal schooling, led him to be a disciple of experiment and experience. -Freethinking attitude and willingness to question dogma saved him from being an acolyte of traditional thinking. -Aided by the sharpness of his eye which caught details that most of us glance over. -"Describe the tongue of a woodpecker"
-Most distinguishing and inspiring trait was his intense curiosity. -Spent most of his career in centers of creativity and commerce: Florence, Milan, Rome. -Few places offered better creative environment than Florence in the 1400s (interwove art, technology, and commerce). The culture rewarded those who mastered/mixed multiple disciplines. -Surrounded himself with students, companions, patrons. -"Ideas are often generated in physical gathering places where people with diverse interests encounter one another serendipitously." WI (why Steve Jobs liked to have central atrium in buildings, Benjamin Franklin founded a club). -In the court of Ludovico Sforza (Milan), Leonardo found friends with diverse passions who could spark new ideas in each other. He moved here initially to recast himself as engineer, scientist, and inventor. -Leonardo began his apprenticeship under Verrocchio at age 14. -Rigorous teaching program that involved studying surface anatomy, mechanics, drawing techniques, effects of light and shade on draperies, beauty of geometry. -When mastering drapery drawings under Verrocchio, Leonardo pioneered sfumato–technique of blurring edges (removes sharp edges so objects appear closer to how we see them). Allows room for our imagination to fill in the rest. Outlines of reality are inherently blurry, leaving a hint of uncertainty that we should embrace. -After apprenticeship ended at 20, continued to work and live there. Reality should inform, not constrain. -Leonardo redefined how a painter transforms and transmits what he observes. -Luster: sparkling glint of sunlight in the eyes and curls of hair. -Mistakes in his early twenties with light, perspective, and human reactions. -First workshop that he opened of his own in 1477, only received three commissions in five years. -Genius undisciplined by diligence. He frequently gave up on paintings and left them incomplete because they were too much for a perfectionist. His willingness to put down brush is also why he's known as an obsessed genius and not a reliable master painter. -At age 30, he was known as a genius but had little to show for it. In his gloom, he left Florence for Milan. -Would make refinements on many of his paintings for years/decades. -Knew there was always more he might learn and techniques he might master, so he would often refuse to relinquish paintings. -Squaring the circle took him years, his notebook filled with attempts. -Leonardo demonstrated a knack for swaying patrons because he knew his audience. -Cast himself as an engineer, architect, and mentioned none of his paintings to Ludovico Sforza (Milan facing threats of local revolt and French invasion). -Design for utopian city was sensible and brilliant. Was never implemented but might have transformed cities, reduced plagues, and changed history. -7,200 pages currently in existence probably only represent a quarter of what he wrote, but that's more than all emails/digital documents from Steve Jobs in the 1990s. -But he was always more interested in pursuing knowledge than publishing it. Made little effort to share his findings. Had no real understanding of the growth of knowledge as a cumulative and collaborative process. As a result, his work had less impact than it should have. -While in the court of Ludovico Sforza, produced pageants. This was a way to channel artistic and technical skills - stage design, costumes, scenery, music, mechanisms, etc. -Mechanical birds and wings he made during this time led him to observe birds more closely and consider real flying machines. -Saw art and science as interwoven. Art required deep understanding of anatomy, which was in turn aided by a profound appreciation for the beauty of nature. Intense studies here made him a better artist. -Depicted in multiple layers (which he also later did while deconstructing complex mechanisms, making drawing for each element), using exploded views, multiple angles, stacked-up layers. -He made 240 drawings with 13,000 words of text illustrating and describing every bone, muscle group, and major organ. -His study of anatomy informed his art, but his other disciplines also aided his anatomical studies. -Discovered the way the aortic valve works (vortices between the cusp and its sinus), only recently validated in 1960s. The "Mona Lisa effect" - creating a stare or gaze that seems to follow viewer around the room. Comes from drawing realistic set of eyes staring directly at viewer with proper perspective, shading, and modeling. -Wove together shadows, lighting, color, tone, perspective, optics, and the perception of movements. Helped him perfect his painting techniques. But also pursued these complexities of science for the pure joy of understanding nature. -His quest for knowledge across disciplines of arts and sciences helped him see patterns. But at the same time, his multi-disciplinary approach helped him avoid letting other patterns blind him. -Willingness to surrender preconceptions, and always remain open-minded was key to his creativity. -Spent the last 16 years of life making additions, distillation of all his accumulated knowledge. -Shows the development of Leonardo's painterly skills, but also his maturation as scientist, philosopher, and humanist. -Reason he wanted to paint Lisa del Giocondo was because she was relatively obscure (not a famed noble or mistress), meant he wouldn't have to take direction from a patron. -Flow of the landscape flows in her and becomes part of her. -Perfected Lisa's elusive smile in his anatomical drawings. Represents his ultimate realization about human nature–never fully know true emotion from outer manifestation. -Provokes a complex series of psychological reactions (which she also exhibits) why so many find her engaging. Awesome takeaways and lessons from Leonardo summarized on pages 519-524. Date read: 9/30/17. Recommendation: 10/10. You would be hard-pressed to find a more profound, relevant book, no matter your position in life. If I had to recommend a single book of Greene's to get you started, this would be it. He begins by defining mastery as the sensation we experience when we feel that we have a greater command of reality, other people, and ourselves. The book offers a deep dive into every element of mastery–including insight for those just starting out and searching for their life's task. True to form, Greene also provides detailed accounts from some of the greatest masters in history–Leonardo da Vinci, Benjamin Franklin, Charles Darwin, Albert Einstein, Paul Graham, and dozens more. 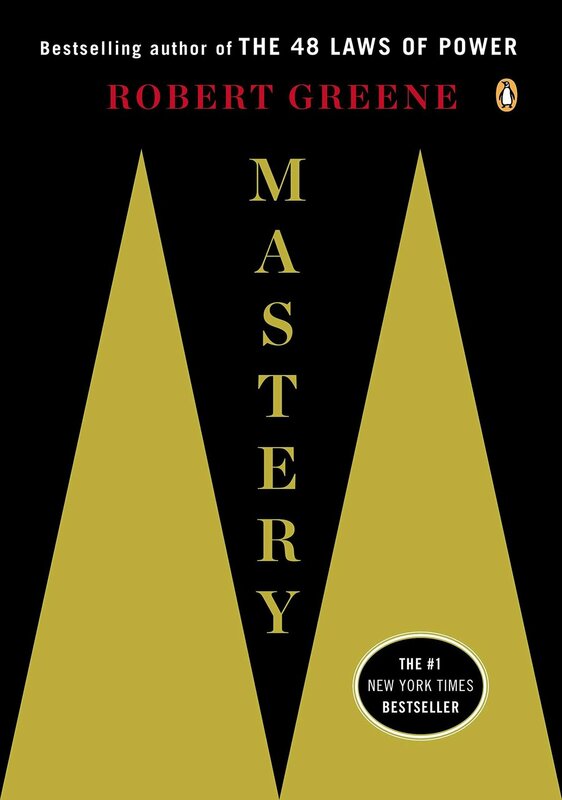 Mastery–the feeling that we have a greater command of reality, other people, and ourselves. For animals, time is their great enemy...To a remarkable extent, our hunting ancestors reversed this process. The longer they spent observing something, the deeper their understanding and connection to reality. With experience, their hunting skills would progress. With continued practice, their ability to make effective tools would improve. The body could decay, but the mind would continue to learn and adapt. Using time for such effect is the essential ingredient of mastery. When we take our time and focus in depth, when we trust that going through a process of months or years will bring us mastery, we work with the grain of this marvelous instrument that developed over so many millions of years. We infallibly move to higher and higher levels of intelligence. We see more deeply and realistically. We practice and make things with skill. We learn to think for ourselves. We become capable of handling complex situations without being overwhelmed. The basic elements of this story are repeated in the lives of all of the great Masters in history: a youthful passion or predilection, a chance encounter that allows them to discover how to apply it, an apprenticeship in which they come alive with energy and focus. They excel by their ability to practice harder and move faster through the process, all of this stemming from the intensity of their desire to learn and from the deep connection they feel to their field of study. Powerful inclination towards a particular subject = reflection of a person's uniqueness. Those who stand out for their mastery experience this inclination more deeply and clearly than others. This intense connection and desire allows them to withstand the pain of the process–the self-doubts, the tedious hours of practice and study, the inevitable setbacks, the endless barbs from the envious,. They develop a resiliency and confidence that others lack. Feeling motivated and energized, we can overcome almost anything. Feeling bored and restless, our minds shut off and we become increasingly passive. People who are passive create a mental landscape that is rather barren. Because of their limited experience and action, all kinds of connections in the brain die off from lack of use. The first move toward mastery is always inward–learning who you really are and reconnecting with that innate force. Leonardo da Vinci's mind worked best when he had several different projects at hand, allowing him to build all kinds of connections between them. What we lack most in the modern world is a sense of a larger purpose to our lives. In the past, it was organized religion that often supplied this. But most of us now live in a secularized world...But without a sense of direction provided to us, we tend to flounder. We don't know how to fill up and structure our time...Feeling that we are called to accomplish something is the most positive way for us to supply this sense of purpose and direction. It is a religious-like quest for each of us. If you allow yourself to learn who you really are by paying attention to that voice and force within you, then you can become what you were fated to become–an individual, a Master. A false path in life is generally something we are attracted to for the wrong reasons–money, fame, attention, and so on. Ignore your weaknesses and resist the temptation to be more like others. Instead, direct yourself toward the small things you are good at. This strategy applies as well to any setbacks and difficulties we may experience. In such moments, it is generally wise to stick to the few things we know and do well, and to reestablish our confidence. Often in their Apprenticeship Phase (self-directed period that lasts 5-10 years), these types are not yet much different from anyone else. Under the surface, however, their minds are transforming in ways we cannot see but contain all the seeds of their future success. The pain and boredom we experience in the initial stage of learning a skill toughens our minds, much like physical exercise. Too many people believe that everything must be pleasurable in life, which makes them constantly search for distractions and short-circuits the learning process. The pain is a kind of challenge your mind presents–will you learn how to focus and move past the boredom, or like a child will you succumb to the need for immediate pleasure and distraction? It is better to dedicate two or three hours of intense focus to a skill than to spend eight hours of diffused concentration on it. You want to be as immediately present to what you are doing as possible. You cannot make anything worthwhile in this world unless you have first developed and transformed yourself. There are two kinds of failure. The first comes from never trying out your ideas because you are afraid, or because you are waiting for the perfect time. This kind of failure you can never learn from, and such timidity will destroy you. The second kind comes from a bold and venturesome spirit. If you fail in this way, the hit that you take to your reputation is greatly outweighed by what you learn. You want to learn as many skills as possible, following the direction that circumstances lead you to, but only if they are related to your deepest interests. You see what kind of work suits you and what you want to avoid at all cost. You move by trial and error. This is how you pass your twenties. You are the programmer of this wide-ranging apprenticeship, within the loose constraints of your personal interests. In this new age, those who follow a rigid, singular path in their youth often find themselves in a career dead end in their forties, or overwhelmed with boredom. The wide-ranging apprenticeship of your twenties will yield the opposite–expanding possibilities as you get older. The knowledge that you need to become a Master exists out there in the world–it is like a base metal or dead stone. This knowledge needs to be heated up and come alive within you, transforming itself into something active and relevant to your circumstances. The best mentors are often those who have wide knowledge and experience, and are not overly specialized in their field–they can train you to think on a higher level, and to make connections between different forms of knowledge. Social intelligence is the ability to see people in the most realistic light possible. By moving past our usual self-absorption, we can learn to focus deeply on others, reading their behavior in the moment, seeing what motivates them, and discerning any possible manipulative tendencies. In all Benjamin Franklin's interactions with people he would force himself to take an initial step backward and not get emotional. From this more detached position, he would focus completely on the people he was dealing with, cutting off his own insecurities and desires from the equation. *Instead you must turn this around and begin with yourself–how you saw in others qualities they did not possess, or how you ignored signs of a dark side to their nature. In doing this, you will be able to clearly see the discrepancy between your illusions about who they are the and the reality, and the role you played in creating this discrepancy. Often it is the quiet ones, those who give out less at first glance, who hide greater depths, and who secretly wield greater power. The personality we project to the world plays a substantial role in our success and in our ascension to mastery. We are quick to discern the mistakes and defects of others, but when it comes to ourselves we are generally too emotional and insecure to look squarely at our own. As your thinking grows more fluid your mind will become increasingly dimensional, seeing more and more aspects of reality...Such originality will bring you to the heights of power. Original Mind: Quality of looking at the world more directly–not through words and received ideas. If we think deeply about our childhood, not just about our memories of it but how it actually felt, we realize how differently we experienced the world back then. Our minds were completely open. Retaining a memory of this Original Mind, we cannot help but feel nostalgia for the intensity with which we used to experience the world. We may seek to retain the spirit of childhood here and there, playing games or participating in forms of entertainment that release us from the Conventional Mind. Sometimes when we visit a different country where we cannot rely upon everything being familiar, we become childlike again, struck by the oddness and newness of what we are seeing. Masters and those who display a high level of creative energy are simply people who manage to retain a sizeable portion of their childhood spirit despite the pressures and demands of adulthood. Some people maintain their childlike spirit and spontaneity, but their creative energy is dissipated in a thousand directions, and they never have the patience and discipline to endure an extended apprenticeship. Others have the discipline to accumulate vast amounts of knowledge and become experts in their field, but they have no flexibility of spirit, so their ideas never stay beyond the conventional and they never become truly creative. Masters manage to blend the two–discipline and childlike spirit–together into what we shall call the Dimensional Mind. The Conventional Mind is passive–it consumes information and regurgitates it in familiar forms. The Dimensional Mind is active, transforming everything it digests into something new and original, creating instead of consuming. You must let go of your need for comfort and security. Creative endeavors are by their nature uncertain. To negate the ego you must adopt a kind of humility towards knowledge. We indulge in drugs or alcohol, or engage in dangerous sports or risky behavior, just to wake ourselves up from the sleep of our daily existence and feel a heightened sense of connection to reality. In the end, however, the most satisfying and powerful way to feel this connection is through creative activity. Engaged in the creative process we feel more alive than ever, because we are making something and not merely consuming. Masters of the small reality we create. You do not look at the parts separately but at how they interact, experiencing what you produce as a whole. Instead of a straight-line development from idea to fruition, the creative process is more like the crooked branching of a tree. What constitutes true creativity is the openness and adaptability of our spirit. When we see or experience something we must be able to look at it from several angles, to see other possibilities beyond the obvious ones. Creativity and adaptability are inseparable. To create a meaningful work of art or to make a discovery or invention requires great discipline, self-control, and emotional stability. But the types of intuitions discussed by various Masters cannot be reduced to a formula, and the steps they took to arrive at them cannot be reconstructed. Through intense absorption in a particular field over a long period of time, Masters come to understand all of the parts involved in what they are studying. They reach a point where all of this has become internalized and they are no longer seeing the parts, but gain an intuitive feel for the whole. Fluid form thinking comes in flashes and insights as the brain makes sudden connection between disparate forms on knowledge. The key, then, to attaining this higher level of intelligence is to make our years of study qualitatively rich. We don't simply absorb information–we internalize it and make it our own by finding some way to put this knowledge to practical use. Every moment, every experience contains deep lessons for us. We are continuously awake, never merely going through the motions. Whatever field of activity we are involved in, there is generally an accepted path to the top....But Masters have a strong inner guiding system and a high level of self-awareness. What has suited others in the past does not suit them, and they know that trying to fit into a conventional mold would only lead to a dampening of spirit, the reality they seek eluding them. Inevitably, Masters make a choice at a key moment in their lives: they decide to forge their own route, one that others will see as unconventional, but that suits their own spirit and rhythms and leads them closer to discovering the hidden truth of their objects of study. This key choice takes self-confidence and self-awareness. The ability to connect deeply to your environment is the most primal and in many ways the most powerful form of mastery the brain can bring us. It is easy to become enamored with the powers that technology affords us, and to see them as the end and not the means. Although we tend to imagine Einstein as the ultimate abstract thinker, his way of thinking was remarkably concrete...If he had any qualities that were extraordinary, they were his patience mixed with his extreme tenacity. In any competitive environment in which there are winners or losers, the person who has the wider, more global perspective will inevitably prevail. The reason is simple: such a person will be able to think beyond the moment and control the overall dynamic through careful strategizing. Most people are perpetually locked in the present. Ideal of the Universal Man–a person so stepped in all forms of knowledge that his minds grows closer to the reality of nature itself and sees secrets that are invisible to most people. Your false self is the accumulation of all the voice you have internalized from other people...who want you to conform to their ideas of what you should be like and societal pressures to adhere to certain values....It also includes the voice of your own ego, which constantly tries to protect you from unflattering truths. Mastery is not a question of genetics or luck, but of following your natural inclinations and the deep desire that stirs you from within. It is in fact the height of selfishness to merely consume what others create and to retreat into a shell of limited goals and immediate pleasures.